Beauty Professor: Giorgio Armani Maestro Fusion Makeup Compact...First Impressions + Swatches of All Shades! Giorgio Armani Maestro Fusion Makeup Compact...First Impressions + Swatches of All Shades! Above: Shade #5 in indoor lighting. After much anticipation, the Giorgio Armani Maestro Fusion Makeup Compact has finally arrived at Armani beauty counters everywhere! This SFP 29-infused, solid form of the original Maestro foundation promises buildable coverage in a convenient, toss-in-the-purse form that makes touchups an extremely simple enterprise. Above: The testers for shades #5.25, #5.5, #7 and #9 in indoor lighting. 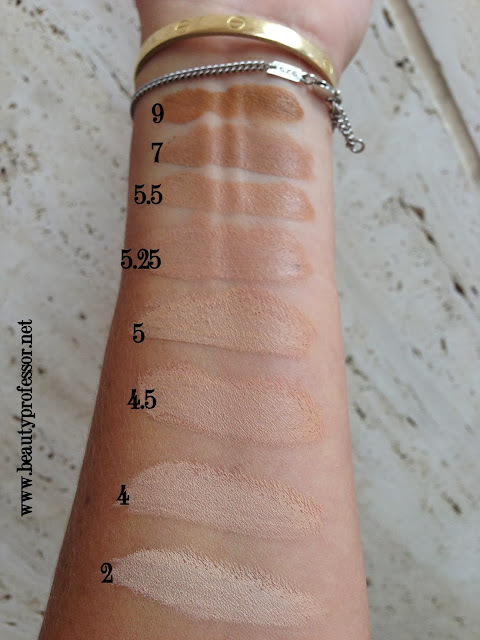 In addition to being able to swatch every shade offering in various lighting, I also picked up my very own perfect match in #5, a light beige suitable for N/NC25 skin tones. Since this is quite a new acquisition for me (I've had the compact for two days), I am not ready to provide a comprehensive review; however, my initial impressions are that this formula offers more coverage and longevity than the original Maestro formula while still maintaining a seamless, perfected, satiny, skin-like finish. Above: Shade #5 in natural outdoor lighting. 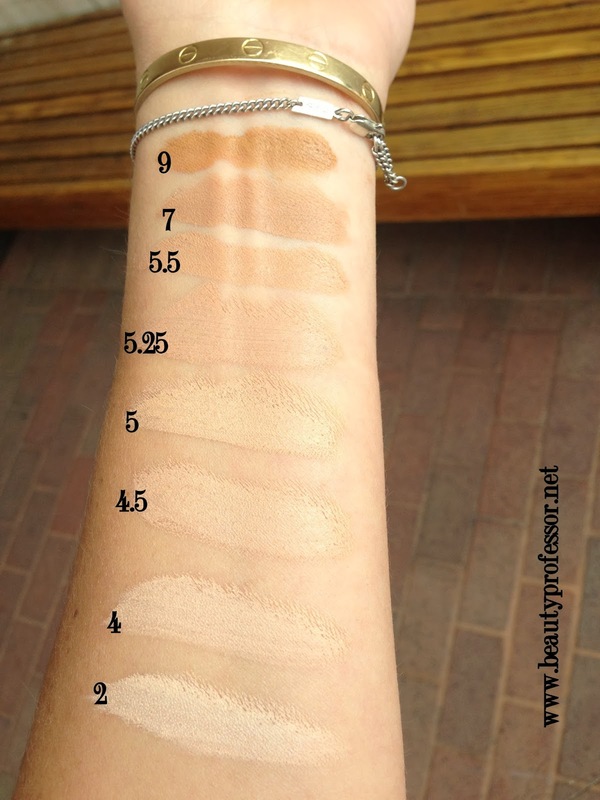 Above: Swatches of all shades in indoor artificial lighting. 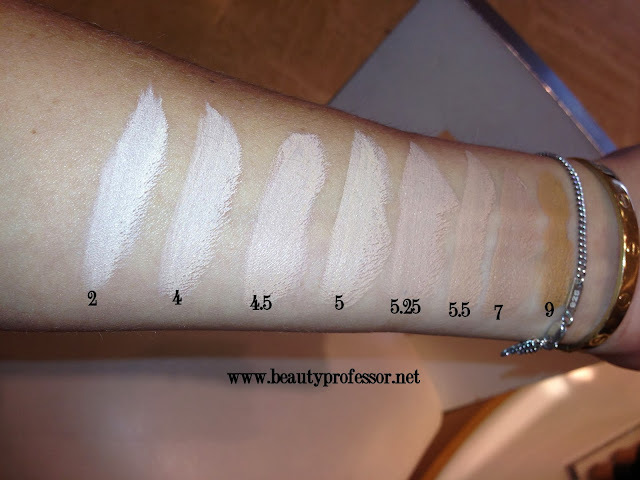 Above: Swatches of all shades in indoor lighting with a flash. Above: A closeup of shades #2-#5.5 in natural daylight. Above: A closeup of shades #5-#9 in natural daylight. Above: Swatches of all shades in natural outdoor lighting. **I noticed that the shades in the Maestro compact run slightly darker than the Maestro liquid...for reference, I am NC23-27, which puts me between shade #5.5 and #6.5 (I own both and sometimes mix them) all year and am a perfect #5 in this formula. Above: Swatches of all shades indoors, with natural outdoor lighting through the door. This is the most true-to-life depiction of the shades in my opinion. Above and below: Giorgio Armani Maestro Fusion Makeup Compact in shade #5 alone on the face (buffed with a Beauty Blender). I added bronzer and blush but did not set this with powder! To be clear, these photos are completely un-retouched. 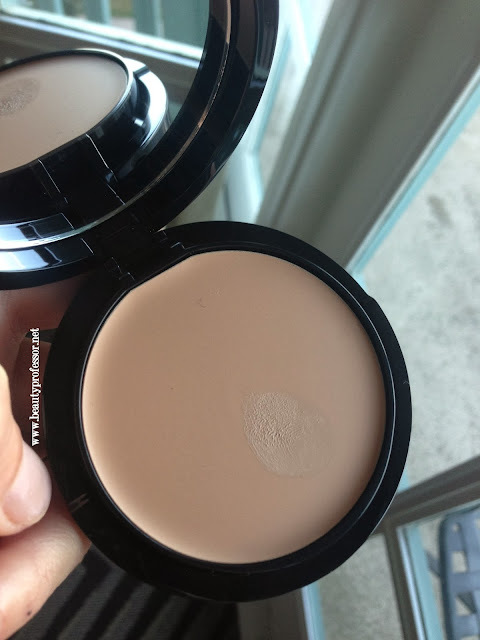 Bottom Line: I have been waiting diligently for the Giorgio Armani Maestro Fusion Makeup Compact since the murmurings about its creation surfaced last year! 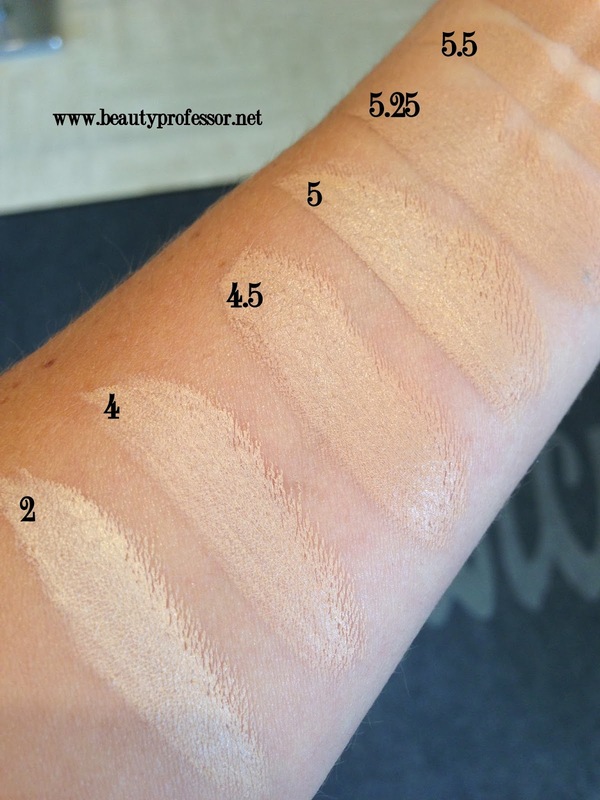 This foundation formula does not disappoint! From the sleek and compact packaging to the gorgeous buildable coverage, I daresay I prefer this version over the original Maestro, whose coverage and lasting power were dubious on days when I needed both. At $64, this is a bit of an investment, but overall, I predict that most foundation enthusiasts will likely find that the supreme nature of the product justifies the cost. Although I apply it with a dampened Beauty Blender, the included brush is fantastic for in-the-moment touch ups. In the coming weeks (after more testing), I will prepare and post a comprehensive review on its ingredients, longevity in different weather situations and my final impressions. In the meanwhile, I wanted to post the swatches to give those of you ordering online the best chance possible of determining your color match. At this point, I believe that my wait for this formula was well worthwhile...highly recommended! I love your blog! You're so intelligent and have great taste. 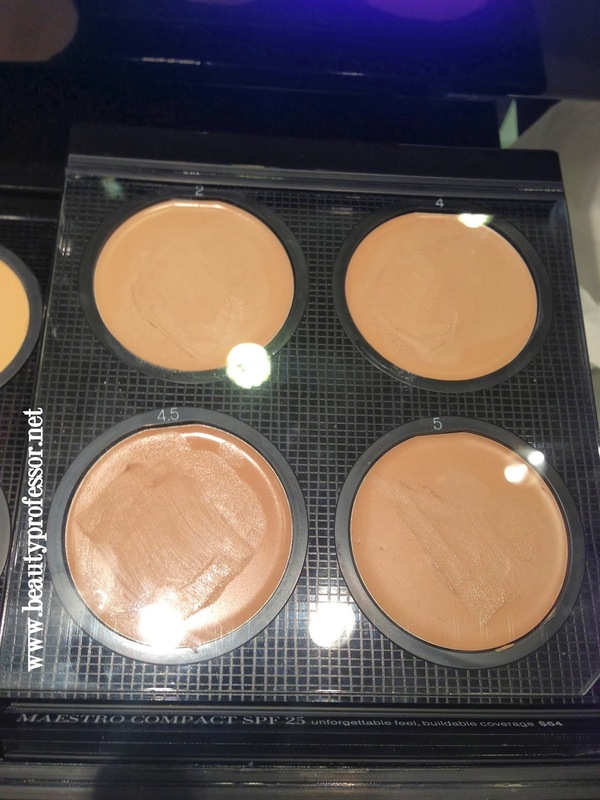 Re the new foundation DAMN GIRL that looks airbrushed! I'm dying to get my hands on this. Looks like hg material. Thanks so much for the sweet compliments! I have realized that this foundation plays well with the camera and what girl doesn't want that?! Really happy to add it to my collection...hope you get it soon! Hi BP! Any thoughts on how this compares to the Kanebo? Thanks for the question...I haven't used this quite long enough to be able to delineate all of the subtle differences, but so far find that it seems to be a bit thinner in texture, with less skincare benefits. The coverage and finish, however, is similar! 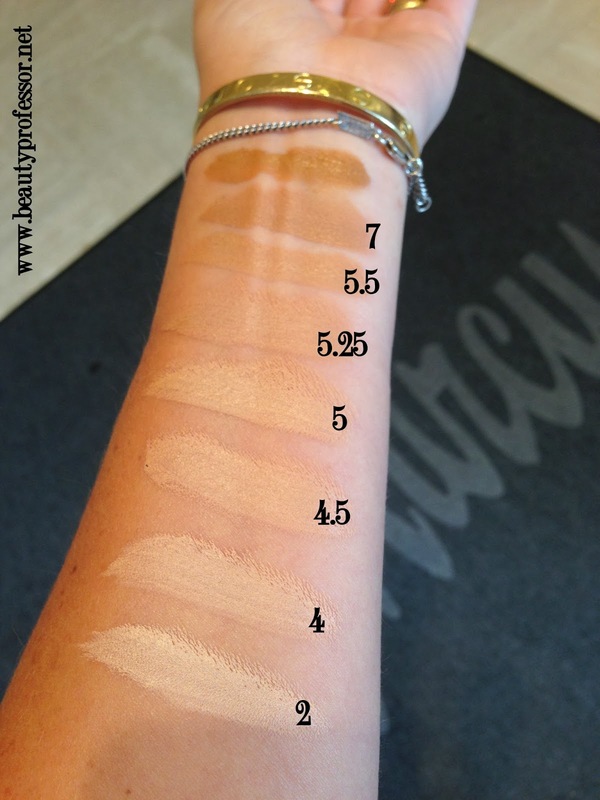 By the way, did you get your Suqqu foundation yet? Thank you ever so much!! This foundation is definitely to thank for that effect ; ) My Suqqo foundation should be arriving any day now...so excited! You? 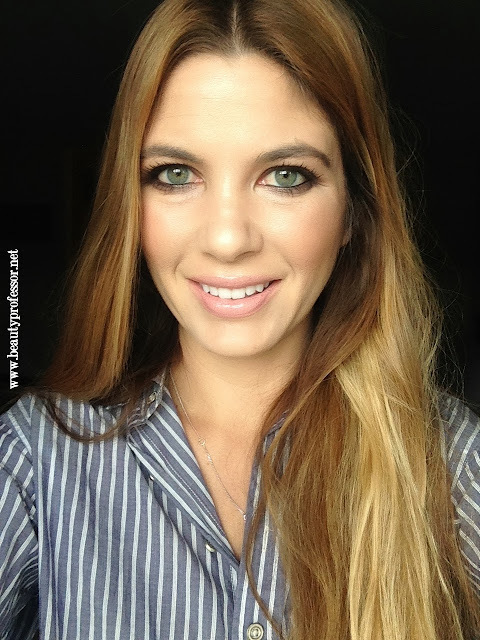 I'm hoping that SUQQU cream foundation will be my savior for the dry winter! How frustrating! I just got mine today...first impressions...it's utterly brilliant! Insane coverage and lasting power (tried it for 14 hours today!). Wow, it has such a lovely finish on your skin! I'll have to check out number 2. Cross your fingers it'll be light enough; I'm a perfect match to number 3 in the Maestro liquid. I have a hunch you'll find a lovely match in #2...do keep me posted! Your skin always looks great but I have to say this is the most perfect I've seen it yet. The color, the natural finish and perfected poreless effect make it hard to believe that the photos are unretouched. Is there any alcohol in the formula? I coveted the super natural effect but skipped the original Maestro due to alcohol being fairly high on the ingredient list.My dry mature skin doesn't tolerate even a smidgen of alcohol. The rest of the makeup is spot on as well. The low-key lip and cheek really bring your skin and eyes to the fore. Beautiful! Thank you very much for the observations on my skin and makeup...so kind! I assure you, there was no retouching in these photos...just snapped them by a window with my iPhone 5, right before heading out to lunch yesterday! There is no alcohol listed in the ingredients on the box but there are 'cones, which are a hit or miss for most beauty lovers. They don't seem to irritate my sensitive skin whatsoever, thankfully. Hopefully this formula will work for you more than the original installment! Lovely on you. Unfortunately all of these shades are just way too pink for me. Thanks, Bella...and so sorry to hear that! Anyway I would like to thank you so much for your great blog and reviews!!! Thank you so much for your sweet comment! I think you will find that the lasting power and coverage of the Maestro compact is superior to the liquid version...I hope you are able to get it in Germany soon! Thank you!! I am so excited that you just ordered this and I think you will absolutely love it as another stellar foundation option. Please keep me updated on which shade ends up working best! Hi B.P, tracked my order. It will be arriving tomorrow at end of the day. I can't wait!! Will try the Maestro compact as soon as I can and update you! xo. 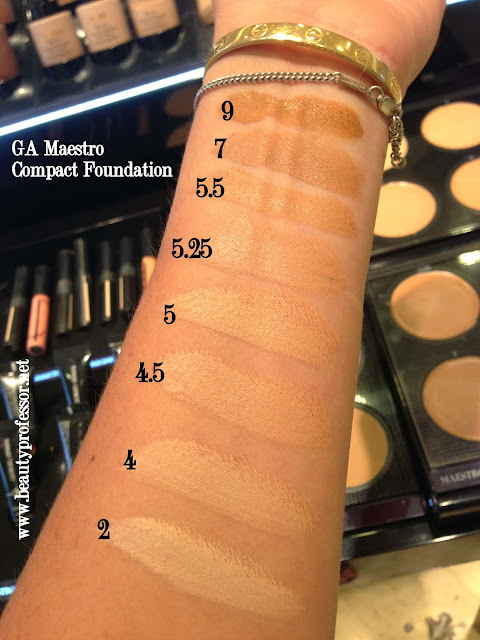 How many grams of product are contained in this Maestro compact? There are 9 grams (.03 ounces) but a little goes a long way (at least in my experience!). Oh my gosh - what a fantastic review!! Thank you for the time and effort you put into swatching and writing this! You look fabulous in this too; I definitely have to check it out! Why thank you, Crista! I had a fun time putting this together and am excited that it is resonating with my readers. Good to hear from you! I find that the compacts run a bit darker than the liquid...I wear between a 5.5 and 6.5 in the liquid but a 5 in the compact! I've the liquid version of this and found it a little drying, multiple sources also mention that the liquid is better for combi-oily skins. A pity, as I love the texture of it! 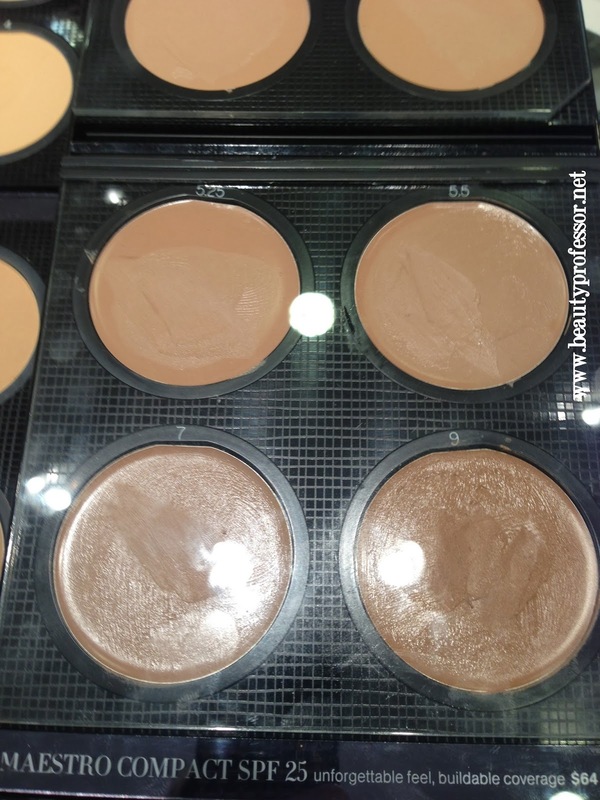 Would you say that the compact is better for normal- dry skin? I'm also NC 25 (+/- a little depending on the season), so #5 would be a good much? The #4.5 looks like it has pink undertones but I'm pretty sure the liquid #4.5 has more yellow undertones. So happy to be able to make your day ; ) Thanks for the good news! I find that the compact is a bit more hydrating (likely due to its cream formula) and if you are a perfect NC 25, then I highly suggest #5...I think you will find it works better than all other shades for your skin tone. I hope you feel better soon and thank you for your consistent readership! Great review! Your skin looks beautiful! 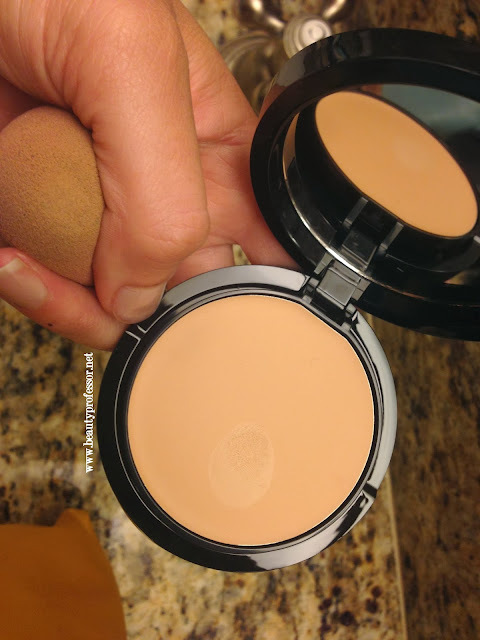 How do the colors of the Giorgio Armani maestro compact compare with GA lasting silk foundation? I love it, but have found that while the undertone is perfect on Lasting Silk #4, it is a bit too light; 4.5 and 5 much too dark. What color to try in the maestro compact? I haven't used Lasting Silk in awhile, but when I did, I was a perfect #5...that being said, I suggest trying #4 in this formula! Wow, your skin looks looks absolutely flawless and smooth in these picture! The shade and texture are perfect on you, assisting you to achieve a put-together look really quickly. I tend to agree from the photos that this formula seems to have more coverage than the liquid version however would you say that the consistency would benefit those with drier skin? Have you tried the Nars Sheer Glow foundation as I would love to read your thoughts if you have. Wishing you a wonderful week dear B.P and talk soon! My pleasure!! I am so glad you enjoyed my recap. Thanks for the sweet words about my skin...the light texture, respectable coverage and good shade match seemed to have worked wonders on my skin : ) I think that the consistency of this cream formula would be perfect for normal to dry skin and, with a bit of blotting powder, could even be a good formula for combination skin. I have tried the NARS Sheer glow and found that the lasting power (rather brief) and texture (got patchy and shiny over time) were just not for me. Another fantastic thorough review with all colours swatched is so helpful. Your sin looks perfect in the photos. I have never used a cream foundation before but from looking at this I may just have to give it a try. How does it wear in the humidity and heat? As we are coming into summer here in Australia (it was 36 degrees here today) I wonder if it may just melt right off. Maybe perfect for winter? It appears so skin like in your pictures it is quite incredible, but in saying that your photos always look great. I think #5 looks aperfect match for my skin. Why, thank you so much...I simply cannot help myself when it comes to foundations ; ) I was able to try this in extremely hot and humid Texas weather last week and it performed beautifully...quite long lasting for a cream formula. I think you would find #5 to be an excellent match! xoxo and have a marvelous weekend as well...talk soon! My pleasure! I am guessing if you are a #3 in the Maestro, then you should find a match in either #2 or #4...both have similar neutral beige undertones, but if you are quite fair, then I suggest the #2. It will just be a matter of preference for you! I just wanted to ask you, to make sure, would you say that # 5.5 in compact is darker than # 6.5 in Maestro liquid? It sure looks so from your swatches. I know you wear 6.5 in the liquid formulation and therefore are in the best position to compare the two. I decided to order both 5.0 and 5.25, see which one is a better match for me, but I want to make sure that leaving out 5.5 is a good idea (based on how dark it looks in your pics, both the indoors and outdoors ones). Many thanks again! Yes, in my opinion (and I stress, opinion! ), the 5.5 in the compact is equal to or slightly darker than the 6.5 in the original. I wear between a 5.5 and 6.5 in the liquid and would say that the 5 in the compact is closest to the 5.5 (my winter shade) in the liquid. If you are exactly a 6.5, then I think you will find 5 too light and 5.25 and 5.5 to be closer matches! Thanks, Christine! I wore it again today am am still pleased with how well it seems to melt into the skin. I hope you get to try this soon and look forward to hearing about your experience! Would you be able to provide a quick comparison between the GA maestro compact and the new NARS radiant creamy compact foundation? Appreciate your thoughts since I am contemplating purchasing one of the two. GA compact is not in Canada yet, but awaiting the release eagerly. Thanks once again for your extremely well-written in-depth reviews and eloquently presentations. Thanks for the question and kind words about my reviews! I prefer the GA compact formula much more than the NARS version. The GA has better, more skin-like coverage, excellent lasting power (I wore it in the heat today for 10 hours with very little need for touch ups) and a lovely glow that does't cross the line to "excessively radiant." So glad to hear you are still liking this....I live overseas so will have to order it and need help with shade selection. I have been wearing the lasting silk foundation in 4, but it is definitely too light. How much darker would the maestro compact4 be than the lasting silk 4? From your swatches, I am thinking about either ordering the 4.5 or 4 in the compact. I have also worn the GA lasting silk powder foundation in 3, if that helps any. I def have some pink undertones, but also some yellow....being a fair redhead. Also, how does the maestro compact hold up in a hot, humid climate? Btw, your skin looks absolutely GORGEOUS with this makeup! Love your blog too! Thanks SO much for your help! Thanks for your kind comment and question!! I am glad that you enjoy my blog! Yes, I adore having this foundation in my rotation! I, too, think you would be either #4 or #4.5 in this formula if you are a #4 in the Lasting Silk. 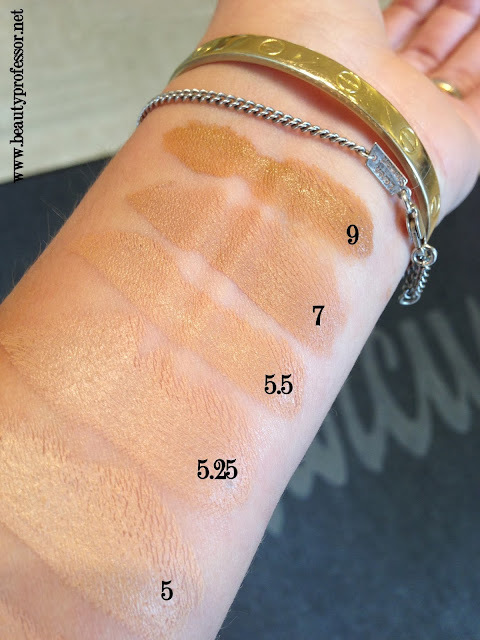 The #4 in this formula is about a half shade darker than the #4 in the LS formula. Since I don't know how "too light" the #4 in LS is for you, I am hesitant to say which is the best match...it will all come down to your preference! This looks so amazing on you. I also love the rest of your makeup. Can you say what eye makeup and lipstick you are wearing here? Thanks! I am wearing the Le Metier de Beaute Kaleidoscope in Carnaby Street and Giorgio Armani Rouge Ecstasy in #103 with a bit of Tom Ford Naked gloss! I want to try this foundation! Your skin looks amazing in it. Is it heavier on the skin rather than the original liquid formula? Also if I told you that my current foundation shade is YSL Beige rose 20, what would you say my shade would be? Thank you I really like this blog! Thanks so much! I find this formula has more coverage than the liquid Maestro and I am guessing you would likely find a match in #4 or #4.5 (on the darker side). Would you prefer maestro compact instead of the lasting silk compact? I like both in different ways, Cathy...the Maestro compact is cream while the Lasting Silk is powder! Great review....im glad i found your blog. As I live in Angola i have to ask a friend who is travelling overseas to bring me the new compact. Im confused with the colours can you help me? i am a 7 in the liquid Maestro. Which colour should i buy in the compact? Many thanks for your help. Thanks...I suggest the 5.5 as a good match for the #7 in the original formula!